Posted by randydeutsch in architect types, BIM, change, collaboration, essence, identity, the economy, transformation, transition. It sometimes seems as though there are two types of architects: those doing architecture and those leaving comments online. Lately, a number of my own comments left at various sites seem to stop the flow of the discussion thread. Is it me? The equivalent of my comment’s breath? Or is it my Type? I believe the best commenters (and architects) play well with others – they reference each other’s comments, build on them, politely beg to differ. And they politely beg others to respond. Their comments move the discussion forward. Mine seem to just sit there like a ton of bricks. Anchoring the discussion the way a chunk of concrete anchors wiseguys at the bottom of the lake. Take for example this comment that I left at AIA’s new flagship publication, Architect Magazine. The article is entitled “A Difficult Character” about how, when a leadership consultant reviewed the Myers-Briggs tests of 100 architects, he discovered there really is an “architect type” — and maybe a difficult one. The big finding of the article is that the most frequent type among the architects was ENTJ — extraversion, intuition, thinking, and judging. ENTJs accounted for a whopping 31 percent of the architects that the consultant tested, despite the very low frequency of the type (estimated at 1.8 percent) within the general population. The article is well-written and engaging. I just thought it was strange that it didn’t acknowledge earlier research that seemed to contradict – or inform – its findings. When Donald W. MacKinnon conducted his famous Myers-Briggs tests on architects in the 1950s and 1960s (published in In Search of Human Effectiveness) he found the vast majority of successful, self-actualized, creative architects to be ENFPs. Our apparent transitioning from FPs to TJs over the past half-century raises two questions: 1. Had architects with less pedigree (read: success, esteem, creativity, self-actualization) been tested 50 years ago would they have likewise exhibited a preference for ENTJ? and 2. Our organizations, profession, industry and world all demand a greater ability to work collaboratively, in an integrated manner: perhaps we would be better off with ENFP’s perception and empathy – two qualities in high demand (and, it appears, low inventory) when working on collaborative, integrated teams? Is it possible to report your own comment as offensive? That comment hit the ground with a major thud and pretty much put an end to what had been an otherwise interesting and energized online discussion. You can still hear the echoes in the corridors of online comments everywhere. And not at all what the discussion needed at that moment. It lacked perception and cooperation. What was needed at that moment was a classically ENFP response: one that exhibited empathy. One that perceptively, and collaboratively, worked well with the commenters who came before – to assure that there would be commenters who came after. Type Talk, along with Please Understand Me, are the 2 best books I have come across that describe the different personality “preferences” or types. Architects, by and large, are natural leaders. And leadership is something we could use a great deal more of right now. But when you dig down a bit into what makes ENTJs who they are – what makes them click – largely has to do with their need for control. And control is not something in great demand today. In fact, it may go a long way to explain some of the frustration of architects who are unwilling to collaborate – whether by sharing their BIM models, participating on integrated teams or even sharing their work and responsibilities with colleagues. Work, more and more, is occurring simultaneously – requiring lateral thinking – not in a linear fashion. And is incredibly draining. All that psychic energy spent trying to get such an unseemly and messy world to line up. Architects have long been order makers – not order takers. But life more and more is unpredictable and unrelenting. 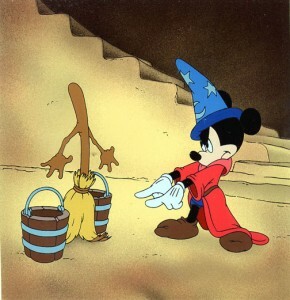 Architects are a bit like Mickey Mouse as the sorcerer in the cinematic animation Fantasia. We can’t help ourselves from wanting the world to stand on command, in some orderly way. But nonetheless can’t seem to mop quickly enough to hold back the deluge. Architects who show a preference for ENTJ want the world to be in uniform and at a sort of moral attention forever. And you know, the world is just not cooperating. Long ago, when I first took the Myers-Briggs assessment, I had been assessed as an ENFJ. But not long after I noticed that many of the world’s most creative architects were ENFPs. So I wanted to become one myself. I put myself through a crash course of sorts. One of the things I did was to catch myself when I was passing judgment, to stop, take a deep breath, and substitute a more general – and hopefully helpful – observation or perception instead. I tried to show more empathy than criticism whenever possible. In fact, for years I taught a segment of a graduate level professional practice course where I purposefully assisted lifelong ENFJs and ENTJs who wanted to become ENFPs. When I retested I was sure enough an ENFP and have remained one ever since. Except for the times I revert, such as when reading through a great discussion thread and I feel compelled to leave an ENTJ-type comment. It’s that part of me that wants the world to be in uniform and at a sort of moral attention forever. And you know, I may be collaborating, but the world’s just not cooperating.